LONDON--(BUSINESS WIRE)--Technavio’s latest market research report on the test preparation market in India provides an analysis of the most important trends expected to impact the market outlook from 2018-2022. Technavio defines an emerging trend as a factor that has the potential to significantly impact the market and contribute to its growth or decline. According to Technavio analysts, the test preparation market in India will grow at a CAGR of close to 16% during the forecast period. The rising number of enrollments in test preparation courses is a major factor driving the market’s growth. The increasing number of student enrollments in the test preparation market, due to rising student competition along with significant decline in the test pass percentage in competitive exams, is the primary reason leading to growth in the market. Hence, students are frequently opting for test preparation courses to increase their chances of clearing competitive exams. The test preparation market in India has witnessed substantial growth in the number of enrollments, especially in online test preparation courses. Another factor that is catering to the rise in the number of enrollments in the test preparation market is the increase in customer spending along with the improved cost of living. The increase in spending power of consumers have resulted in more number of parents enrolling their children into test preparation courses to gain an added advantage in the market over others. Many small players exist in the test preparation market in India, making it highly fragmented. The market follows a B2C model and is the most appropriate model as the providers directly cater to students. There is a high demand for government services and bank probationary officer (PO) courses among students as such jobs provide job security and well-paid salaries. The popularity of online test preparation in India is increasing as many students, and working professionals in Tier 1 and Tier 2 cities are opting test preparation courses for Bank PO exams and government services. “In Tier 1 cities, majority of the students opt for online training due to its increased flexibility and ability to track their performance over time. Apart from this, engineering and medical fields have also witnessed an increase in demand for test preparation during the forecast period,” says a senior analyst at Technavio for research on K-12 and higher education. 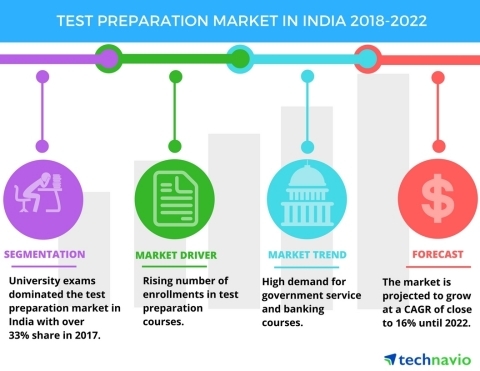 This market research report segments the test preparation market in India into the following products (university exams, certification exams, high school exams, and elementary exams) and end-users (post-secondary and K-12). The university exams segment held the largest market share in 2017, accounting for nearly 33% of the market. The market share for this application is expected to decrease nearly 2% by 2022. The fastest growing application is high school exams, which will account for 26% of the total market share by 2022. The post-secondary segment held the largest market share in 2017, accounting for nearly 62% of the market. The market share for this end-user is expected to decrease nearly 3% by 2022. The fastest growing end-user is K-12, which will account for 41% of the total market share by 2022.
energy reports. Offer valid from 12th March for a limited period. Technavio's latest market research report on the test preparation market in India provides an analysis of the most important trends and drivers.